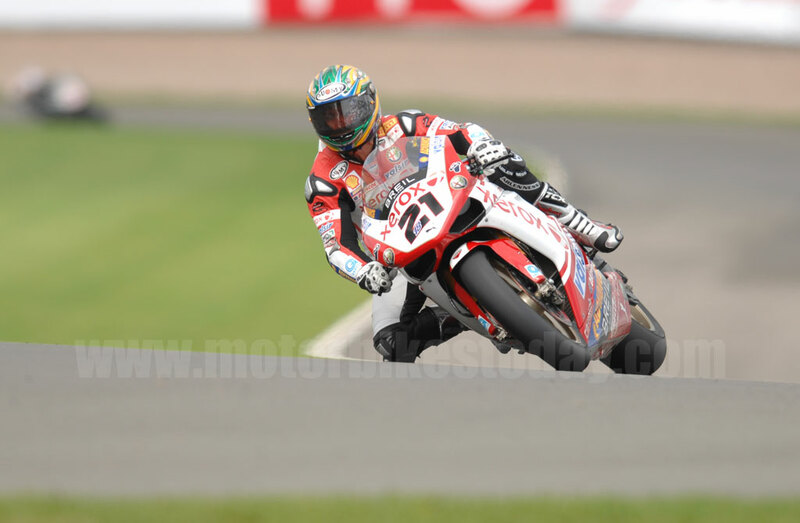 Bayliss finally gives Donington the finger. 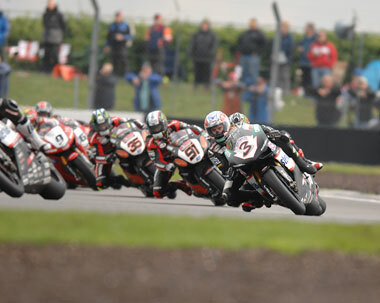 . .
Donington Park, where SBK all began, is a recent return to the calendar, replacing the somewhat featureless and unloved Silverstone. And featureless isn't an accusation you could level at Donington, with its elevation changes and sweeping bends making it a genuinely interesting circuit, both to ride and to watch. Last year this circuit saw Toseland winning the first race and his bike breaking in the second, and Bayliss having his huge crash in which he injured certain parts of his body in ways which will make all our male readers wince - so we shan't go into it! 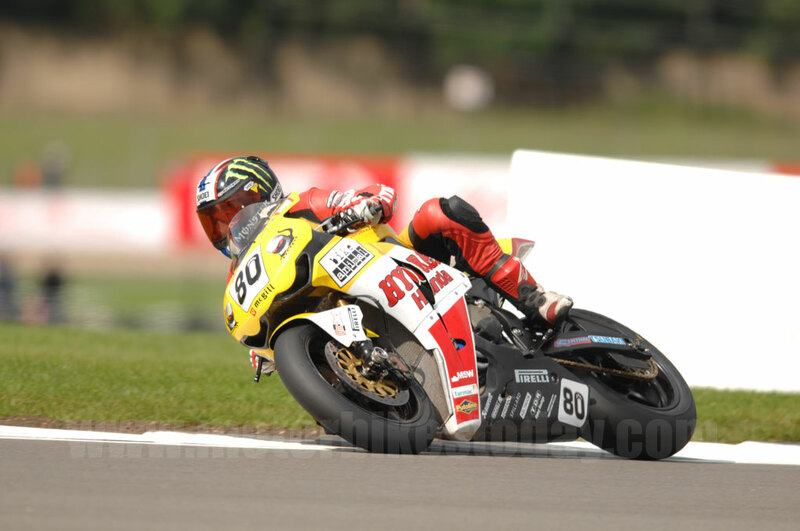 Haga then went on to win race two. This is the circuit that Haga races best at in the UK, as his first ever UK race was here in the snow and he won by a landslide. Qualifying was wet, wet, wet - and I'm not talking about the band. This meant that everybody kept swapping places as they struggled for grip. Donington is notoriously greasy at the best of times - pitlane gossip says the planes going in and out of East Midlands airport just next door dump excess fuel on the track - and when it's wet it just gets less predictable with some places offering more grip than you'd expect while others are like ice. Obviously British wildcard riders are used to the fickle conditions as they race here all the time, and by the end of Saturday's qualifying Cal Crutchlow, sporting a number 18 in dedication to his friend Craig Jones underneath his usual number, was fastest with current British champion Kiyonari second and Leon Haslam, also with the 18 under his number, third. Troy Corser and former British champion Troy Bayliss were fourth and fifth while Haga seemed to be coming back on form being up in sixth. Tom Sykes kept up his impressive performance with seventh, ahead of Checa eighth, Biaggi ninth and Fabrizio rounding the pack off in tenth. But all that did was decide who would get into Superpole, which would be wet. No doubt about that. Wet Superpole, you know the drill by now – twelve laps maximum over a fifty minute period with all people who qualified for Superpole out at once. Whoever gets the fastest time gets pole. That has the potential to be carnage. The slippery conditions soon caught out Troy Bayliss, who went on the gravel but stayed on the bike, rejoining with no problem. Less fortunate was Jakub Smrz who highsided at the fast Schwantz Curve, fortunately walking away unhurt, while Cal Crutchlow also managed to launch his Honda into the scenery, again walking away unscathed. Troy Corser continued his uncharacteristically crash laden weekend, falling off with fourteen minutes to go. As with the rest of the time, he was OK but the bike was a bit worse for wear. 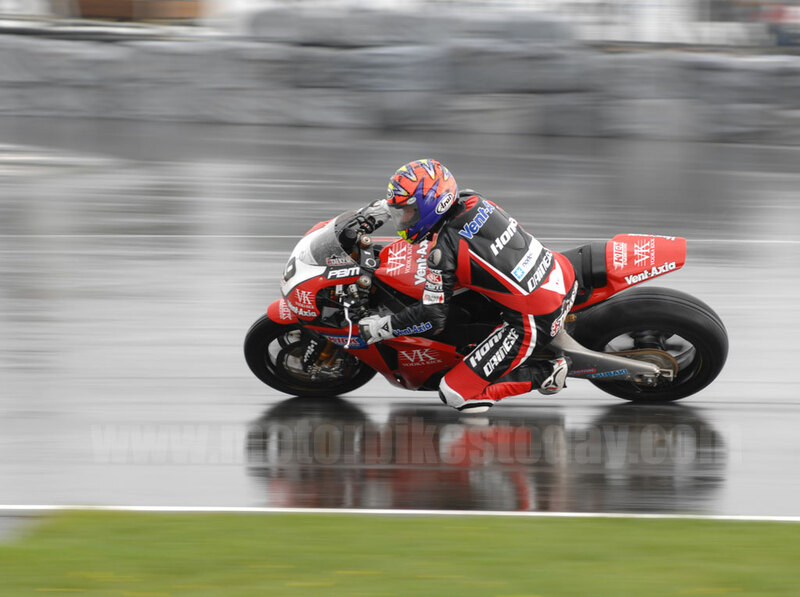 That’s a problem with wet Superpole because everybody is giving it their all with full throttle on a slippery surface, it causes a lot of accidents. And it’s astonishing just how for bike and rider slide before they come to a stop. Just to demonstrate, Tom Sykes also fell off with a mini highside, not a nice one but mercifully he too got up and walked away. With just a few moments to go the session was controlled firmly by Bayliss and Kiyonari, Bayliss having taken the lead after a smooth and unusually controlled ride from Kiyonari briefly out him on top. Then Troy Corser put in an astonishing performance, a full third of a second quicker than Bayliss at the second split and looking certain to take pole, but exiting Goddards, the off amber, downhill hairpin onto the start finish straight he highsided the Yamaha, stopping sliding about ten feet short of the line. Donington doesn’t seem to be his track for Superpole as he also fell off last year when the wind literally lifted him off the bike. So the top ten for the grid were Bayliss, Kiyonari, Checa, Xaus making up the front row with Ellison, Biaggi, Sykes, Corser, Crutchlow, Fabrizio making up the next six places. I would not like to be caught between ten to thirteen, as it is Fabrizio, Haga, Haslam and Walker. That will be interesting to see who elbows who out of the way first tomorrow. Race One started with a surprise. The rain had gone away and there was a distinct dry line on the track. Kiyonaritook the lead from the first corner closely followed by Sykes and Bayliss. Bayliss overtook Sykes three minutes in and Corser was working his way up by overtaking Checa to get to fifth position. On lap two Kiyonari crashed out of the lead at the old hairpin as the back came round, forcing Bayliss to sit up briefly. Kiyo was unhurt but mortally embarrassed. 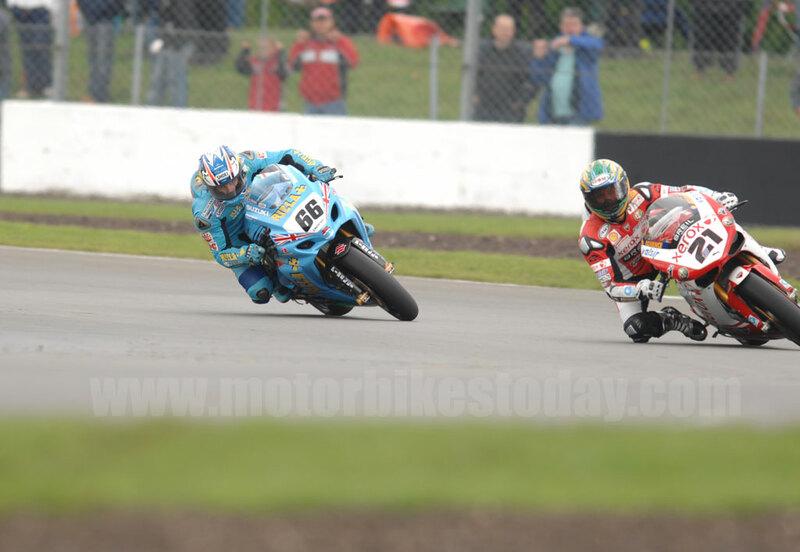 On the same lap, Laconi went on the gravel, nearly saved it but then dropped the Kawasaki on the grass. So at the end of the first lap we had Bayliss in the lead followed by Sykes, Xaus and Corser. Sofuoglu added to the list of gravel surfers fairly shortly afterwards while laconi limped back to the pits and retired. Sadly Chris Walker had to retire from the race with technical problems on lap five after a very strong showing, and Max Neukirchner also soon retired after a crash. 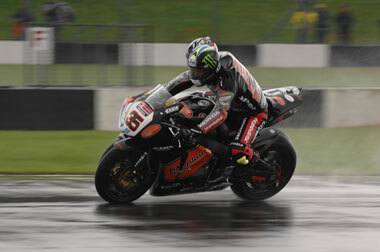 Tom Sykes was flying as the track dried out further and took the lead when he passed Bayliss on lap six as the champion elect ran wide at Macleans. Carlos Checa and Sebastien Gimbert had a brief sojourn into the gravel at Goddards, Checa managing to get the Honda restarted and on his way while Gimbert's Yamaha was fit only for the great parts bin in the sky. Then it started to get really exciting. Exiting the old hairpin, Haga's bike suddenly started smoking. A lot. Haga was black flagged immediately but bizarrely, despite clearly being aware of the problem, he elected to ride around and pull into the pits instead of simply pulling over and getting a lift. This was a Bad Thing as, in short order, Checa (again), Corser, and Tamada all crashed out at Goddards, apparently on the oil spilled by Haga. Checa again showed his normal luck and sprinted away to get back to the pits. But Corser and Tamada both crashed much harder, Corser in particular landing badly while Tamada was narrowly missed by his cartwheeling bike. Both made it back to the pits but both were clearly suffering. Immediately after Tamada's crash the red flags came out. So that meant a two leg race over full distance. Which meant that there would be fourteen laps of mayhem. All riders were able to replace tyres and so on if they wanted. But Checa, Corser and Haga didn't get back into their pit within the allotted time span of five minutes and so were excluded from the next leg. When the race re-started Sykes took the lead from the first corner and the Pocket Rocket, Leon Haslam, slipped into second. Bayliss then overtook Rolfo, who was riding probably the best we've seen this year, to get third. Fabrizio soon crashed out on the way down Craner Curves, coming to rest just before sliding onto the track. Up at the front, Bayliss started trying to challenge Haslam for second place, which Haslam held for a while until Bayliss’ efforts finally prevailed. Bayliss then went on to overtake Sykes and stay in first place, Haslam also overtook Sykes to keep chasing the championship leader. It's worth noting that times are aggregated. In other words, they add the times together from the first and second legs to get the result. Bayliss needed to get over three second ahead on the road to take the win. The rejuvenated Rolfo tried to overtake Haslam and Sykes on the inside of the Foggy Esses when they were battling for second. He lost control of the bike and Through himself at the mercy of the ground,Unfortunately this bit of ground was occupied by Leon Haslam. This knocked Haslam off his bike too, leaving him way down in seventeenth when he re-joined the race. James Ellison was riding up a storm as well but got overexcited and ran off the track, rejoining in time to not have lost many places, which was lucky. Xaus and Lavilla then overtook Nieto, but then the rain came back and red flags were waved for the second time. Xaus fell off his bike on the last lap. The final results, after a dazzling display of very, very fast motorcycling by both Bayliss and Sykes, gave us Bayliss, Sykes, Biaggi, Lavilla, Kagayama, Smrz, Nieto, Haslam, Muggeridge and Ellison. Sykes and Haslam both turned out to have given their advantage away by mistaking the SBK "Reduced grip" flag for the BSB "Pace car on track" flag. Mainly because they are, in fact, the same. So they rolled off a little leaving Hollywood and Bayliss was there. Race Two was declared wet race with the start delayed for five minutes. The race started out with the heavens opening. But it didn't last, becoming dry and sunny later on before raining again. On the first corner Bayliss took the lead followed by Kiyonari, Xaus, Biaggi and Walker. Kiyonari soon overtook Bayliss and Corser slotted into fourth, behind Biaggi. 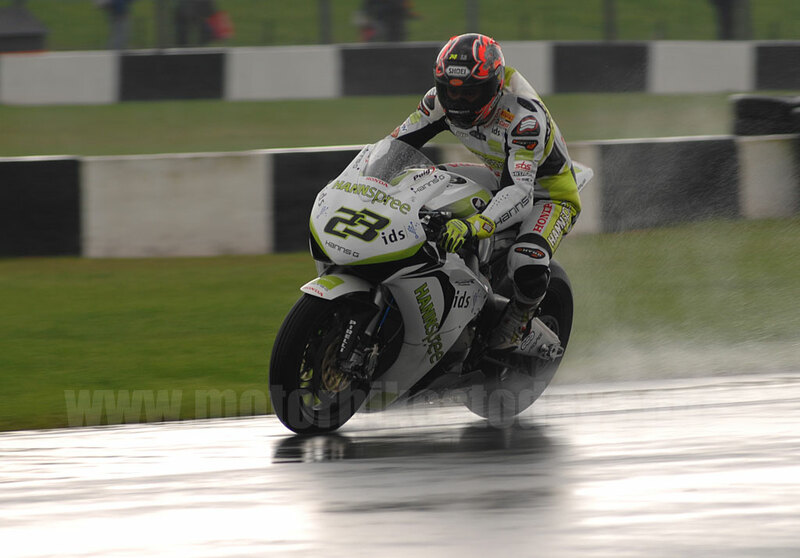 Haga was penalised with a ride through as in race one he did not immediately leave the track when shown a black flag. Bizarrely, the Japanese rider came in for his ride-through but not when he was supposed to, having come in earlier than required. This quirk in the rules resulted in his being black flagged and taking home a fat zero for a tough weekend's work. Chris Walker went for the save of the weekend award as he ran wide in Craner Curves, taking to the grass at some hundred and thirty miles an hour and not only keeping the Honda upright but managing to rejoin at the old hairpin without clobbering anyone either. 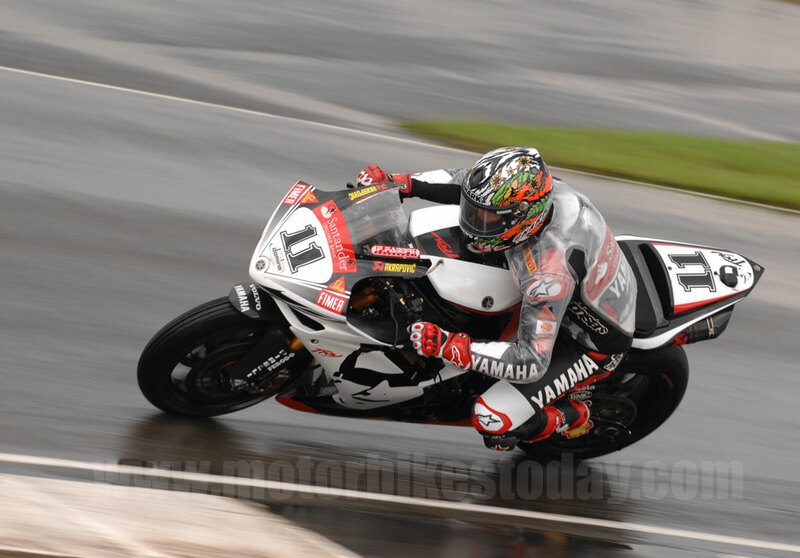 Corser soon managed to get past Biaggi, climbing to third and hotly pursuing Bayliss. Gimbert added a second DNF to his previous one as the Yamaha stopped running. Vittorio Iannuzzo joined him in the pits shortly afterwards.. Nearer the front, Cal Crutchlow was on blinding form, having started ninth and moved up to fourth, ahead of Haslam and Xaus. Not for long, though, as he continued up to take third in a neat passing move at Goddard's. On lap six Biaggi and Xaus started to battle for seventh, with Biaggi prevailing, while Crutchlow had started to chase down Bayliss. On lap ten Fabrizio managed to overtake Xaus into eighth place. Back to Crutchlow, who was now in second place as Bayliss crashed out at high speed at Starkey's Bridge on lap eleven, and pitted in after re-joining. This left the standings on lap fourteen as Kiyonari, Crutchlow, Corser and Haslam making up the top four. 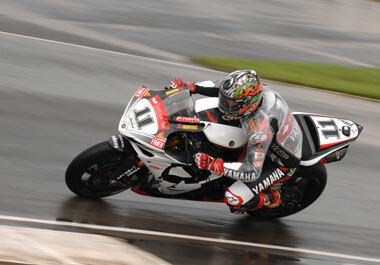 Walker’s luck also was out this weekend, despite his earlier valiant effort, as he and Nieto both had technical problems and retired into the pits, whilst David Checa crashed at Coppice, the site of his brother's excursions in the first race, on lap nineteen while Tamada went onto the gravel but re-joined the race. Yet another person who was out of luck was Leon Haslam, who crashed out on lap twenty at the old hairpin, almost exactly the same way as kiyonari in race one, and didn’t re-join. Then on lap twenty-two Muggeridge crashed just before the finish line, which just about sums up the likeable, gutsy Australian's luck as he would have got a reasonable result if he had finished. 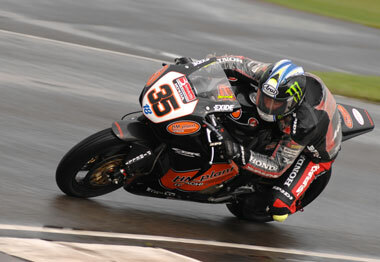 This left the final standings as Kiyonari, Crutchlow, Corser, Ellison, Fabrizio, Biaggi, Lavilla, Xaus, Checa, Sykes. A scrappy race but one which showed some fantastic machine control from Kiyonari and Crutchlow. We can't go away without mentioning James Ellison, who must have been disappointed with his tenth in the first race but who rode an absolute stormer, despite making a mistake that dropped him back down the field, to take fourth in race two. We should also mention Matt Lynn, deputising for the injured Jason Pridmore in the Alto Evolution team. 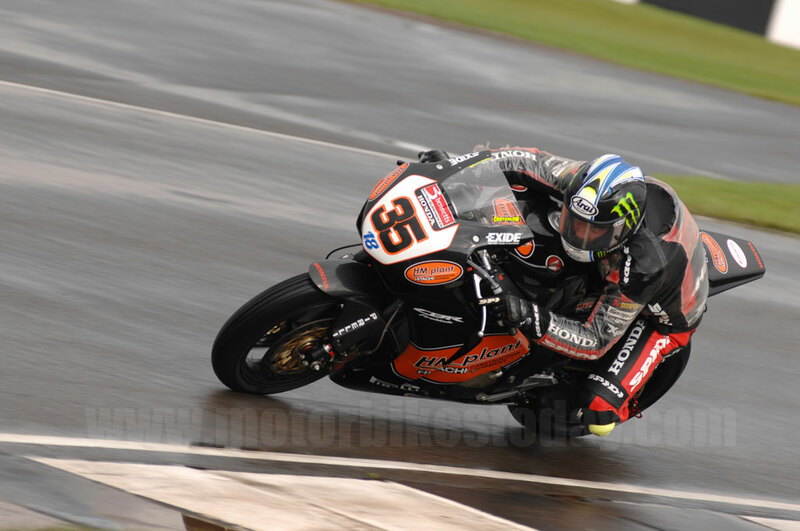 Matt has never been outside the USA before, and to come to Donington, a difficult circuit to learn, in these conditions and to maintain a respectable pace says a lot for his abilities. He should be with the team for the rest of the season, so expect great things in the sunshine of Vallelunga.